A village of 105 lit up households. But how to make renewable energy sustainable? A 30-km drive from Chhattisgarh's border with Madhya Pradesh, through the Maikal mountain range, can take one to Ranidhera village. Power lines loom over the roads, promising electricity. But the cables run out on the poles leading up to the village. Installed one year ago, the poles provide little more than hope for the hopeful. Cableless poles notwithstanding, the village has got accustomed over the past one year to cfl (compact fluorescent lamps). An small power plant, running on biofuel from the jatropha oilseed, supplies them at least three hours of electricity each day. It was set up by Winrock International India, an affiliate of the us-based Winrock International, as part of a project for sustainable, renewable energy. A part of this project was to grow jatropha locally.This has not happened yet, which means the non-profit buys jatropha seeds from neighbouring markets. The oilseed's cost and its carriage place a burden on the project. Winrock chose Ranidhera from 50 remote villages it had assessed for setting up the project, said Arvind Reddy, who handles the non-profit's rural energy group. It came from an ongoing collaboration for electrification with jatropha oil of Winrock, the Union Ministry of New and Renewable Energy, and the Chhattisgarh Renewable Energy Development Agency. Financial support has come from the ministry, the British High Commission, and the Swiss Agency for Development and Cooperation. 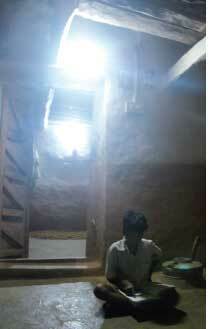 Work began in 2005 and by April 2007, all 105 households in the village had electricity for three hours a day. Winrock provided for free wiring and gave each household one cfl, distributing more lamps as per demand and affordability, said Reddy. Now, 30 households have one lamp point and 75 others have two. When some villagers wanted to run a television, the non-profit gave sockets to 60 households. "The demands were met very meticulously and in proportion to the availability of the seeds," Reddy said. A village energy committee manages the demand for extra fittings; it has equal representation from the two main communities in the village the Gond and the Baiga. Winrock trained the committee members for managing the utility and collecting tariff, which comes to Rs 3,500 per month. Of this, Rs 2,500 goes into the salaries of the three operators of the power station, and the remaining for operation and maintenance. Users pay Rs 20 per month for each lamp and another Rs 30 for each socket. Electricity from jatropha is costlier than that from the power grid, "but is cheaper than kerosene, something that the villagers were using till the beginning of last year," Reddy said. Chotan Dhurve, a Gond resident, agreed; apart from the cost, he had to travel up to eight km to major markets because the ration shop near the village did not stock kerosene. 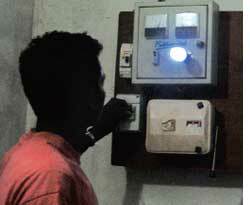 If and when the villagers get electricity from the main grid, they would have to pay Rs 30-40 per month for three hours of power--subsidized by a government scheme. Ranidhera jatropha-run power plant, housed in a small building in the village, has three generator sets of 3.5 kVA (6 horsepower) and a backup generator of 7.5 kVA (10 horsepower). The backup includes the expeller that extracts oil from the jatropha seeds. "The three operators selected by the village committee attend to the entire process, from extracting oil to running the gensets," said Ratan Dhurve, Ranidhera resident. Winrock calculated each 11-watt lamp required about six kg of seeds each month, and each socket a little more than 10 kg per month.To supply the entire village, the power plant needs almost a tonne of jatropha oil. 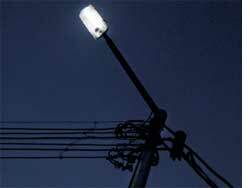 It also supplies 30 streetlights, though the village is not charged for it. Reddy said the number of connections in the village at an optimum number given the availability of seeds. About the time the project started, the Chhattisgarh government distributed jatropha saplings for free to promote the biofuel. Had these saplings borne fruit, the raw material would have come for free. This depended on the village running an operation nursery. This did not happen. One year into the project, Winrock buys jatropha seeds from markets in nearby areas at Rs 5-16 per kg; then there are transport costs, which take the total mothly cost to Rs 5,000-8,000, depending on the number of trips needed. Winrock did not provide the estimate for the total expenditure on seed since the operation started. Villagers planted the saplings in about 10 hectares in 2006, though the project began in 2005. The jatropha plant takes three years to reach the maturity required for optimal seed production; so there will be no seed in the village till 2009. Winrock said this was a pilot project and their aim was to demonstrate the concept. It expected seeds to grow by the end of October this year, and estimated the production of 30 tonnes--enough for the 12 tonnes of oil needed to run the power plant for one year, the non-profit said. This assumed all going well with the plants. This is not a foregone conclusion, as proved by some wild monkeys, which uprooted some of the saplings a few months ago. Reddy described his fear "In case of crop failure, we will have to resort to diesel. We haven't thought of any alternative." And then the villagers want more electricity for more uses. "It is just light that we get now. What about our farms? 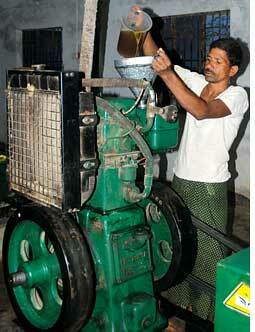 The irrigation pumpsets do not run on jatropha oil," said Raju Dhurve, farmer. Winrock has researched the possibility of biofuel for pumpsets and plans to set up a biofuel pumpset by the end of the year. Reddy said he wanted to be sure of the requirement first because it would increase the demand for jatropha seed. Winrock has several other projects lined up for the village. In July this year, a rice de-husking mill running on jatropha oil began operations--Winrock foots the bill for the jatropha seeds and oil. It is also trying to make briquettes of the deoiled presscake for use as cooking fuel. The difficulty is the presence of toxins in the presscake. Arun Sahu, a social worker familiar with the area, was concerned about the projects after Winrock withdraws and hands them over to the village. He said rivalry between the Gond and the Baiga would hinder smooth management of the operations and the assets. "The Gond are known to dominate the Baiga and there is a likelihood that they would control the village committee soon after Winrock pulls out," Sahu said. Winrock said it had not noticed any rivalry betweent the two groups, except some Baiga electricity users delaying payments.